Care for Body, Mind and Smile – Why Integrated “Wholistic” Dentistry? Just think about it: the more confident you feel about your teeth, the more you smile. The more you smile, the better you feel, and the better those around you feel. One little smile can start changing the world! Unhealthy smiles, on the other hand, not only limit your joy and confidence, they can disturb your systemic health as well. That’s why, at All About Smiles, we concentrate on our patients as whole beings, not just as teeth. We call it Integrated “Wholistic” Dentistry. Your body is an interconnected system, and when something goes wrong or is unhealthy in one part, the rest of your body can go out of balance too. When we talk about holistic dentistry, we aren’t just talking about healthier materials, we are talking about “Wholistic” dentistry- dentistry that takes into consideration and treats your whole body. 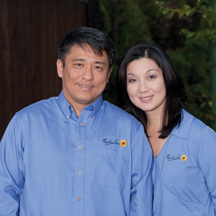 The experience of “wholistic” dentistry begins at your very first appointment. We do more than look at your teeth, take x-rays, and measure your gum pockets; we also look at your posture, check your TMJ health, and evaluate you for signs and symptoms of sleep apnea. We will also talk to you about your dietary and sleep habits. TMJ disorder affects from 5% to 12% of all people and is one of the most commonly occurring musculoskeletal conditions resulting in pain and even disability! It can limit cognitive ability, affect relationships and diminish your quality of life. Our patients are always evaluated for TMJ disorder and other musculoskeletal conditions. When restorations are needed, we make sure your bite is balanced and comfortable. And if you do exhibit any of the signs of TMJ disorder, we can use the methods of neuromuscular dentistry, coupled with treatments from our chiropractic or even physical therapy partners, to bring your body back into a state of relaxation and health. Over 95 percent of our population has some level of periodontal or gum disease. That’s a major problem when you consider that more and more studies are showing clear connections between gum health and whole body health. It has, in fact, been proven that the bacteria from gum infections are often directly linked with such health problems as heart attacks, strokes, diabetic complications, cancers, problems during pregnancy and low birth-weight infants, among other things. In other words, the bacteria present in your mouth during gum disease can make you very sick! That’s why we are such sticklers about keeping gums healthy. When it is time to have your gums checked or treated for periodontal disease, you can be sure that our diagnostic methods are outstanding and that our periodontal therapy will be painless and effective. Do you have a reasonable and regular bedtime and yet never feel rested? Have you been told that you snore? You may have a more serious problem than just snoring or fatigue – you may be suffering from sleep apnea. And sleep apnea can have devastating effects on your health. Sleep apnea has been shown to lead to poor work or school performance and impaired driving that can be just as dangerous as drunk driving. In addition, sleep apnea can also lead to chest pain, morning headaches, depression, even strokes and heart attacks. We can assess your snoring problem, let you know whether it is sleep apnea or not and help you resolve mild to moderate sleep apnea issues with a small and comfortable, custom made oral appliance. There’s a lot of truth to the old adage, “you are what you eat”! We could also say that you smile what you eat, because the things you eat and drink have a very direct effect on the health of your teeth and gums. The diet of most Americans is lacking in many of the nutrients our bodies need to function efficiently. This poor nutrition affects the entire immune system, and increases your risk for periodontal disease. That’s why we offer nutritional counseling and support, including diet advice and supplements from Hallelujah Acres. We are here to help you feel better, look younger, and live more fully than you ever thought you could! 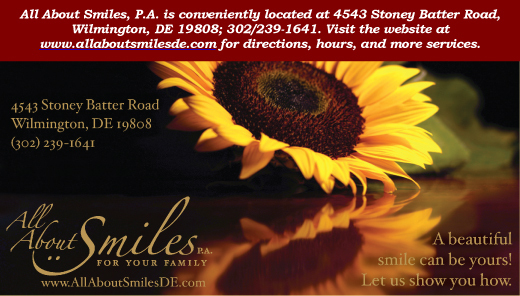 For more information about our “wholistic” approach to your health, please feel free to call us at 302-239-1641, or visit our website, allaboutsmilesde.com.